Green sea turtles nest on beaches across Okinawa, including mainland Okinawa and the surrounding islands such as Zamami and Kumejima. Nest sites selected by mother turtles are most often on the backshore that has uneven beach topography and permanently vegetated areas. 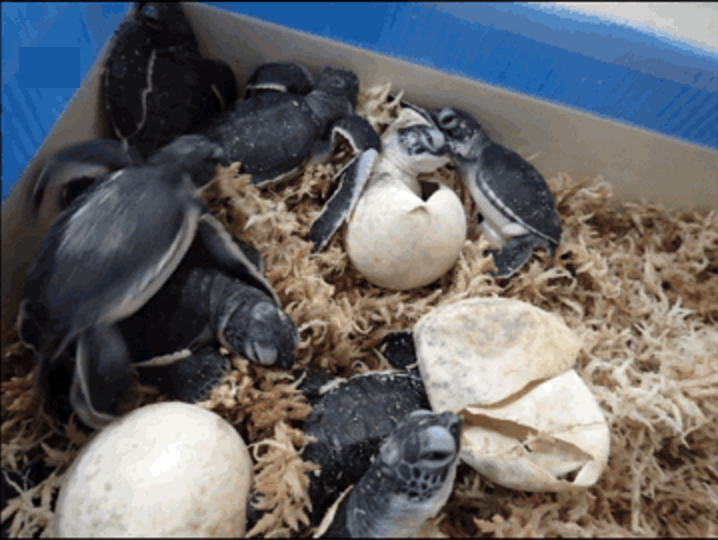 Approximately two months after nesting, the hatchlings emerge from their nests in a frenzy and immediately move towards the sea and swim actively offshore. Kijyoka Beach is a beach located in the northern part of Okinawa. Though three species of sea turtles nest here, it is not an ideal spot for sea turtles due to light pollution, proximity to roads and wild vegetation. On a night in August, 2015, a female Green Sea Turtle arrived to nest on Kijyoka Beach but mistakenly entered the main road instead and was fatally hit by a car. Rescuers from the Churaumi aquarium arrived at the scene and realized that this female turtle had not yet nested at the point of the accident. 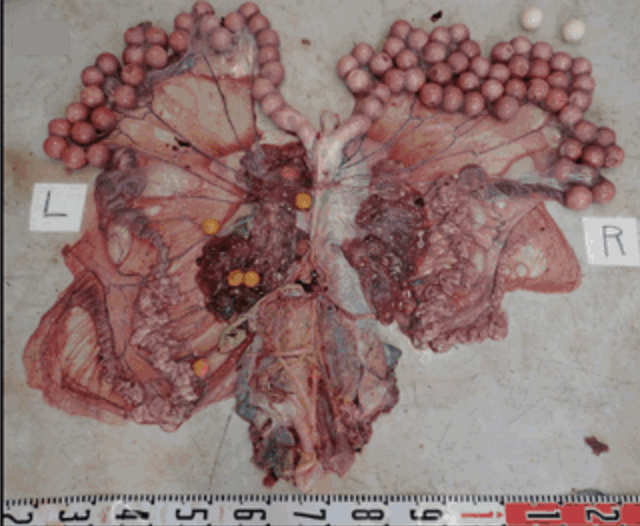 They examined her reproductive organs and retrieved 83 eggs from her oviducts. After 58 days, 20 baby turtles successfully hatched from the eggs! An important take-home message from this anecdote: It is essential to preserve the shore environment for sea turtles to safely lay their eggs. 1. Turn off lights visible on nesting beaches or use special fixtures to shield the lights from the beach. 2. Use low-pressure sodium-vapor lighting (LPS) instead of normal lights. 3. Use Turtle Safe Lighting – these red lights emit a very narrow portion of the visible light spectrum, which is less intrusive to nesting sea turtles and hatchlings. 4. If disoriented hatchlings are found away from the sea, call the Churaumi Aquarium. 5. Tint windows that face the beach. 6. Close opaque curtains or blinds after dark to cover windows visible from the beach. Finally, please be careful if you are driving along the coast of Okinawa during sea turtle nesting season (April-August). Original Marine Turtle Newsletter article by Kawazu et al.can be found here. 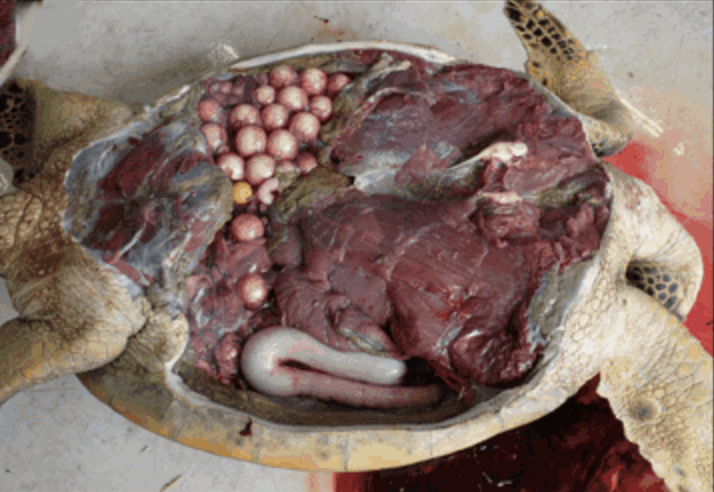 « (English) How do plastic get stuck in sea turtle nostrils? (English) Sea Turtle Art Show: Great Collaboration and A Great Success!